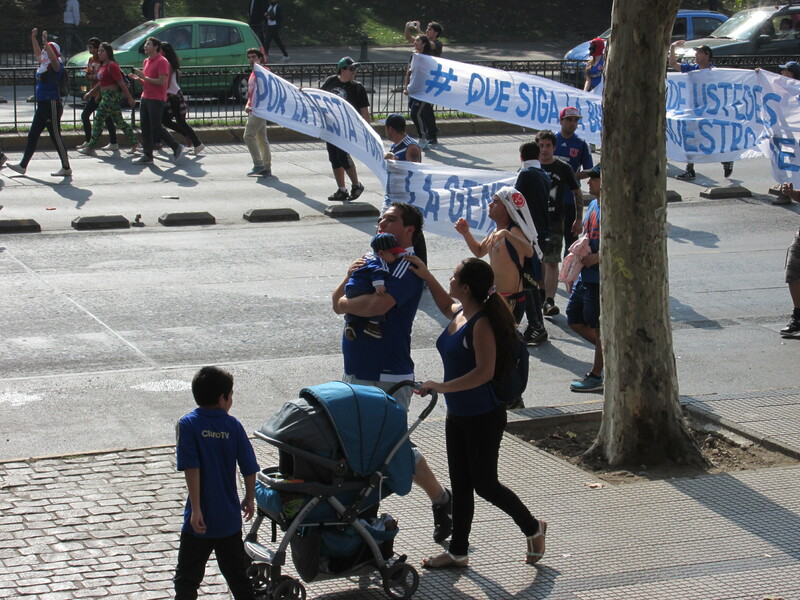 Some other volunteers in other parts of Chile attended the matches, as all the game are in various cities throughout the country. 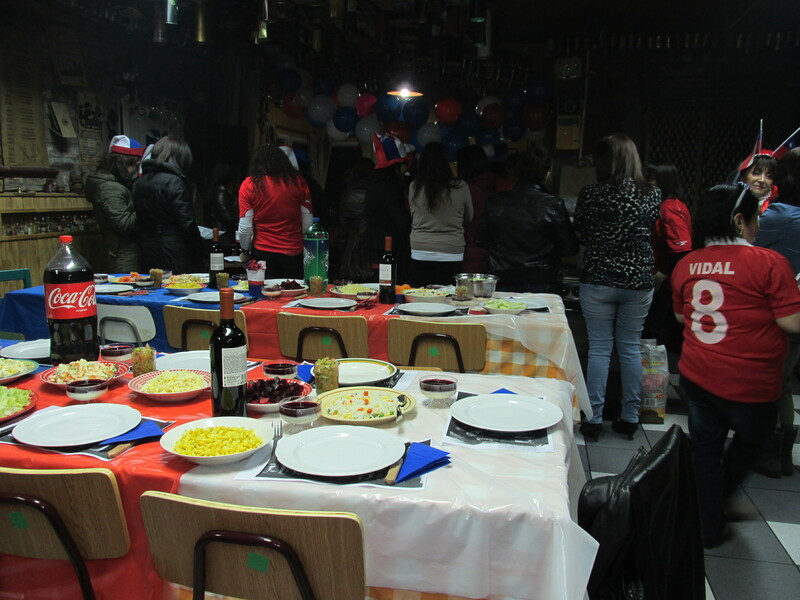 For the Chile-Mexico game I was invited over to another volunteer’s house to watch it with her Chilean family. And wow… They were prepared! Coloured wigs, funky glasses, horns, beer, and even a half-time hamburger! 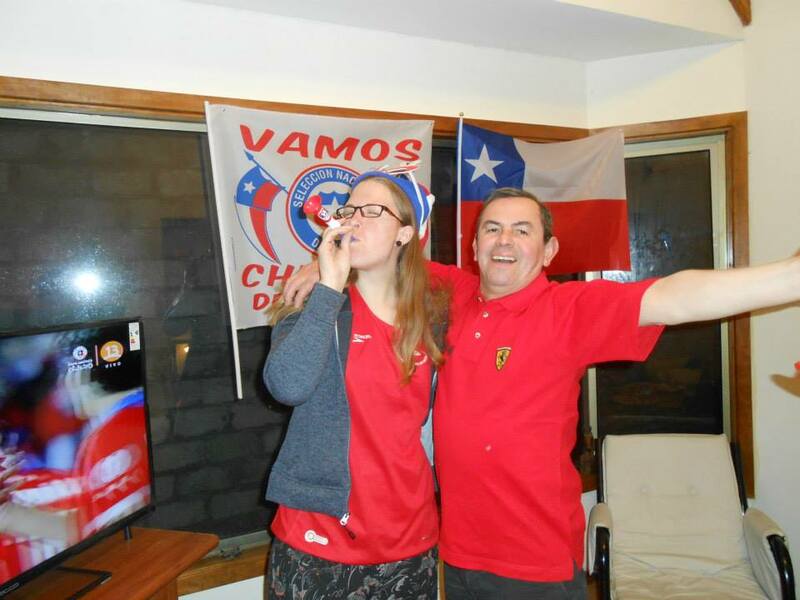 Any time Chile scored they’d get up, cheer, blow the horns, hug and kiss everyone. It didn’t matter that there wasn’t a stadium or pub full of people with them, they celebrated just as much! By the end of the match I even found myself sitting on the edge of my seat hoping for a last-minute goal from Chile, as the game ended in a 3-3 draw. 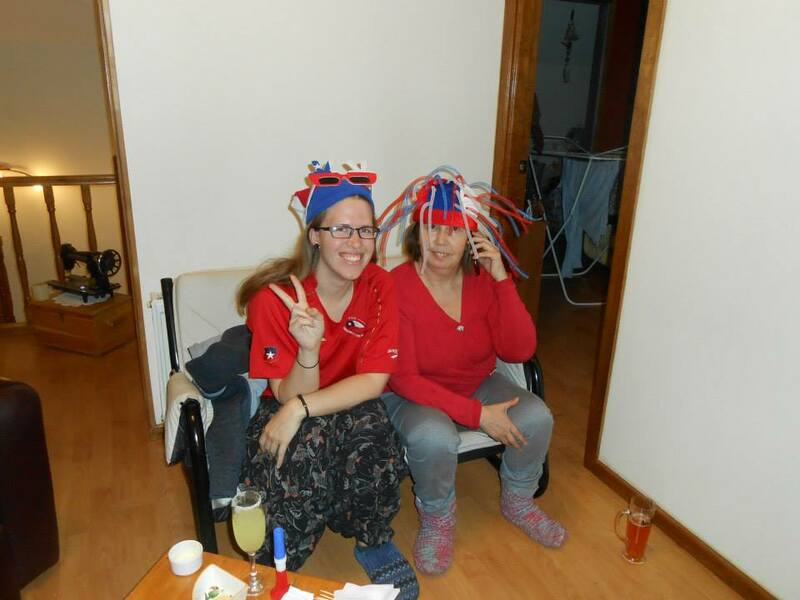 Susan and her Chilean mum, ready to support Chile! The next game, Chile vs. Bolivia, coincided with a Father’s Day party organised by the female school staff for all the men. There was definitely a lot more crowding around the television screen rather than decorating and eating all the food laid out! Chileans always arrive late to parties, but I don’t think it was a coincidence that most of the men arrived roughly 20 minutes after the game ended. With a 5-0 win to Chile, I’m quite glad I wasn’t at Susan’s house having to celebrate like crazy and receiving kisses every single time. Next up was Chile vs. Uruguay, a game with more yellow cards than I realised was possible, a ridiculous amount of falling over and over-reacting, and some real heat between the teams. Most of the game went by as a draw. Finally a goal for Chile 10 minutes before the end, followed by a massive celebration, and then right at the end there was nearly a fight on the pitch. This meant the game went in to overtime by 7 minutes as the clock still ticked while they sorted out their petty differences (Not sure why they don’t just stop the clock…). Finally the whistle is blown without another goal and we all go crazy – I’m not in to football but I go along with it all anyway! After all, I’m partly here to experience another culture so if this is what they do then let’s get stuck in. I watched this game at Susan’s house and before the match I was told I’d get a lift home if we won, and now I know why! We all hopped in the car, wigs and hats on, flag flying out the window, driving through the residential area beeping the horn and waving the flags. It felt almost like being a hooligan but as we got closer to town we clearly weren’t the only ones. I wondered if this was all because we’d beat Uruguay (big rivals maybe?) or we’d made it to the semi finals, but nope! This was just because we’d won, and this is how the town celebrates. Everyone heads to the plaza de armas (central square) to drive around and make a lot of noise – waving flags, constantly beeping horns, cheering, waving from the sunroof of the cars – but it was pretty much gridlock with the amount of cars all doing the same thing. All this crazy celebration shouldn’t have been much of a surprise for me, as I got a taste of the football fanatics during my weekend in Santiago, when a parade of fans were heading towards us cheering down the street. At first glance I thought we’d stumbled upon a protest, with firecrackers, banners, deafening noises and the whole street closed. I didn’t want to accidentally get caught up in some political controversy in my first week here! Walking a bit closer we found out it was just a mass of football fans cheering for the upcoming game. This wasn’t just a hooligan’s day, this was a family event! As we were walking in the opposite direction we eventually came to the end of the parade, where the carabineros (police) were brining up the rear. What was left after the frenzy of excitement was what I imagine to be the aftermath of a zombie apocalypse. Empty road, bits of paper flying everywhere and a stark silence compared to the deafening roar of cheers from before. 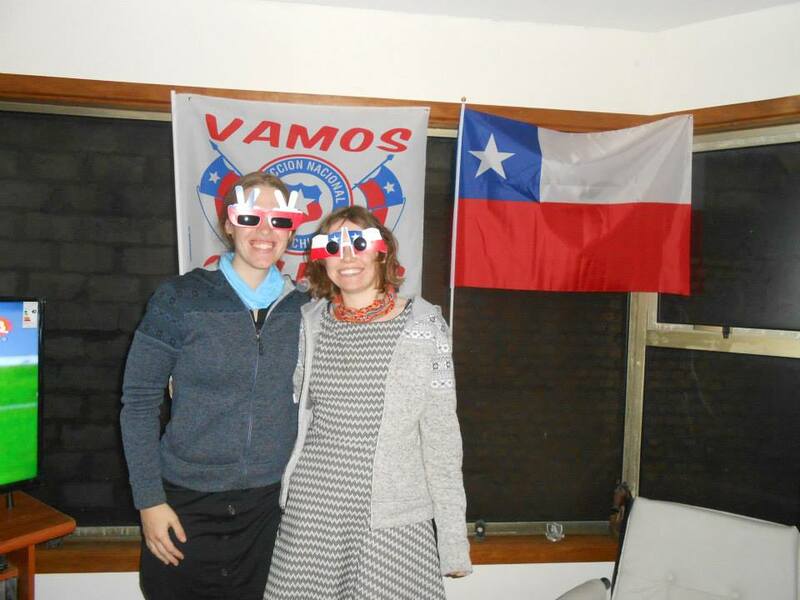 Rocking out with Chile glasses! I’m definitely still not a converted football fan, and I’m definitely going to visit the newly-found rugby store in town, but it’s all good fun getting a glimpse of how this country enjoys sports. I still don’t understand tactics, or even what counts as offside in football, as it all looks like a disorganised mess on screen. But hey, I’m not just here to teach English, I’m also here to experience another culture and by the amount of citizens enjoying this football frenzy, this is clearly a big part of it! The final will be this Saturday so I’ll update you all with the result! 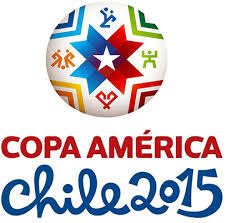 UPDATE: Chile are the champions! Click to read my post about it.